NEWS: announcing the definitive rave DJing legend Mark Archer (Altern 8) to play! Celebrating 30 years in the music business – he was right there at the start of teh acid house revolution. 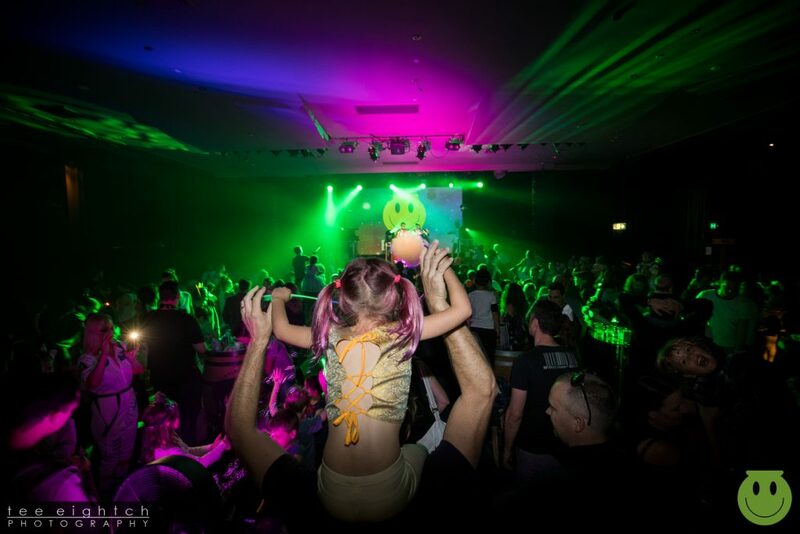 World famous, award winning, Glastonbury Festival performing, family rave sensation BFLF throws the ultimate family event in Watford at the wonderful Collosseum after our first three sold out shows so buy early to avoid disappointment. Live DJ will spin club classics old skool, house, techno, UK garage, drum’n’bass and anything else that take their fancy. The multi-sensory dancefloor comes alive with glitter cannons, bubbles, giant balloons and a parachute dance finale. We may photograph or film small parts of the event and by entering you are giving your permission for these to be used for BFLF or Hawth Theatre promotion purposes. BFLF sets and monitors the volume using World Health Organisation guidelines – so that is it at a safe level for everyone, even the youngest babies, over the 2 hour duration of the event. Though quieter than at adult events, it is still loud enough to feel like you are at a club. Most parents do not use ear defenders on their children but if yours are particularly sensitive to noise or if you want them to nap then you might want to consider it.